Residents cast their votes at a polling place on November 4, 2014, near Ferguson, Mo. As the end of Barack Obama’s presidency grew closer, election officials began preparing for the next election. Instead of strengthening the security of voting machines and making voting more accessible to citizens, states did the exact opposite. But they didn’t just make it harder to vote. For hundreds of thousands of registered, eligible voters across the nation, they made it impossible. 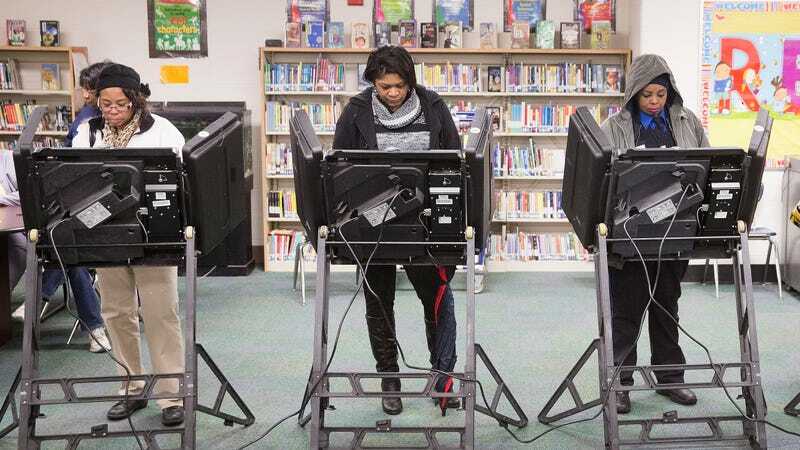 Voter Purges (pdf), a new report by the Brennan Center, highlights the systematic purging of voters from rolls by state and local officials around the country. These are not random, isolated cases. It is a methodical effort that disproportionately affects minority voters. Even worse, no one seems to care. In 1993, Congress passed the National Voter Registration Act (NVRA) which was an attempt to make registering to vote easier by offering driver license applicants the opportunity to register to vote. The law also prevented states from purging voters unless they met certain requirements. But the Brennan report highlights how states have skirted the law and purged voters without punishment. And after the Supreme Court dismantled the requirements for voter pre-clearance with the Shelby v. Holder ruling, states with histories of voter discrimination no longer required federal pre-clearance before purging rolls. Between 2014 and 2016, 16 million registered voters were removed from state rolls, 33 percent more than were moved between 2006 and 2008. For the election of 2012 and 2016, the Brennan Center estimates that two million fewer voters would have been purged if those states had to apply by the provisions of the Voting Rights Act. In June 2016, the Arkansas secretary of state gave a list of 7,700 names to county clerks to be removed from the rolls because of supposed felony convictions. That list included people who had never been convicted of a felony and formerly convicted persons whose voting rights had been restored. In 2013, Virginia deleted 39,000 names from its voting roster. In some counties, the mistakes on the list were as high as 17 percent. A federal court halted a purge after Hurricane Katrina after justices found that one-third of the purged names came from a majority black parish in of New Orleans. After the Shelby v. Holder decision, Texas purged 363,000 more voters than it did the election cycle before the case. Georgia purged 1.5 million more voters. Alabama, Indiana and Maine have illegally instituted the widely ridiculed Crosscheck system (on which Charles D. Ellison previously reported on for The Root) that purges voters without federally-mandated notification. Instead of checking out inequities, Jeff Sessions’ Department of Justice has been urging states to do more purging. Almost every type of voter purge disproportionately affects black voters and voters of color. Some states purge rolls based solely on names but non-whites are more likely to have the same names. According to the U.S. Census Bureau, 16.3 percent of Hispanic people and 13 percent of black people have one of the 10 most common surnames, compared to 4.5 percent of white people. Black and Hispanic voters are more likely to move, often in the same jurisdiction, but voter purges based on address eliminate them from voting. Officials also use “voter caging” which intentionally sends mail to verify addresses in a format that cannot be forwarded, leading to the disenfranchisement of hundreds of thousands of eligible voters. African Americans are also more likely to have felony convictions, and elderly and minority voters are more likely to be incapacitated, all reasons for which someone can be purged from a voter roll. Almost every study ever done on this issue shows that in-person voter fraud is almost nonexistent. Instead, these purges are intentional efforts to restrict voting rights. Public notifications of impending voter purges. Making purge lists available to the public, including at polling places. Accepting provisional ballots from purged voters. Universal voter registration forms and rules. Stop using failure to vote as a reason to purge voters. All of these policies seem like they would be universally-accepted fixes for a flaw in our democracy. But then again, not having a Russian agent for a President seems like a smart thing too. How’s that working out?